Los tapetes traseros se pueden personalizar en tamaño y forma. Shipping & Availability Envío GRATIS de los tapetes FloorMat para la 2.ª ó 2.ª y 3.ª fila de asientos si compra los tapetes FloorMats delanteros al mismo tiempo. Envío GRATIS de todos los juegos de tapetes FloorMats adicionales (para un vehículo con 2.ª, 3.ª fila de asientos, etc.) cuando los compra al mismo tiempo. Gratis: Envío GRATIS de un revestimiento del área de carga si lo compra con cualquiera de los tapetes FloorMat. Los tapetes para todo tipo de clima WeatherTech tienen canaletas profundas diseñadas para retener el agua, la sal de carreteras, el barro y la arena. Todos tapetes para todo tipo de clima están fabricados en un elastómero termoplástico de avanzada similar al caucho que es un material sin látex casi inodoro aprobado por OEM, que no contiene PVC nocivos, cadmio ni plomo y que es 100 % reciclable. Los tapetes para todo tipo de clima conservan su flexibilidad aun en entornos de temperaturas muy bajas y vienen con un acabado protector antiadherente que facilita y agiliza la limpieza. Para evitar que se muevan, incluyen un reborde antideslizamiento en la parte inferior del tapete. Todos los tapetes para todo tipo de clima WeatherTech cumplen con requerimientos FMVSS302 y se fabrican en Estados Unidos bajo las normas ISO 9001, su garantía de calidad. Disponibles para automóviles, camionetas, minivans y SUVs. Five Stars!!! Wow - perfect fit and the grommets snapped right in. What an improvement over my worn out floor mats. Thank you WeatherTech. Thinking I will keep my car for a few more years. How much $$$ does that save me? I thought these were pretty pricey but wanted to protect new car floorboards, but they were perfect fit. I can see how they will do exactly what I wanted. 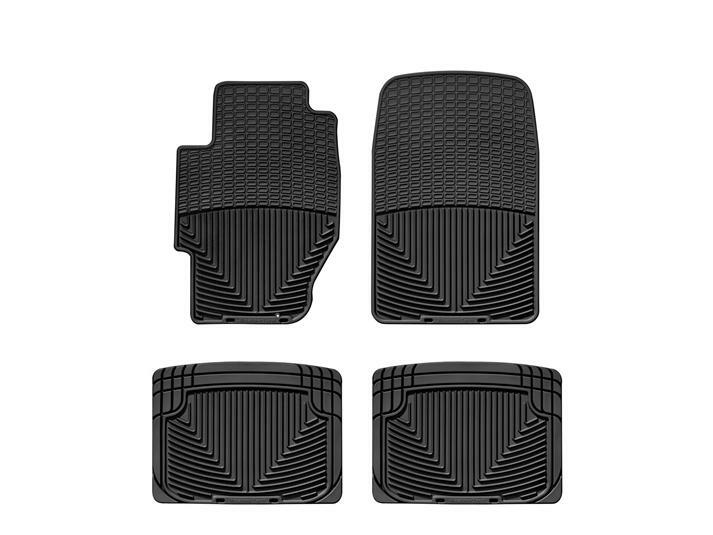 We have been buying full sets of Weathertech mats (cars) or floor liners (Suburbans) for several years now. I never had an issue with any of the products. One of the snaps broke on the driver side front mat in the Mercedes. I hoped I could buy a new replacement snap. I contacted customer care through the web site and quickly a new set of front mats showed up. That is customer care at it's finest. I was already a great fan because (A) Weathertech proudly boasts Made In The USA and their American workforce and (B) Provides custom mats for every vehicle I have ever tried to get mats for. Now I can add (C) Weathertech stands behind their product quality and will replace it if it breaks. Thanks to Marc for taking care of me. I live in a harsh climate in West Virginia where we average 180" of snow each year. Purchased WeatherTech floor mats for my new Subaru Outback in 2006. Three years later, purchased the same for my new Nissan Frontier in 2009. Both sets of mats have done an excellent job holding all the snow and mud drug in the vehicles for 13 and 10 years respectively. Just bought a new Honda Passport to replace the Subaru. My first purchase for the Passport-----a new set of WeatherTech floor mats. We have both cars outfitted with your floor mats and have bought them for both of our older children. Very satisfied and even in the snow climate it is easy to remove the mat and restore it to like new condition. Our original purchase was in 2013 and we recently bought a new car and have to have WeatherTech in it for the floor mats and the cargo mat. Big believer in WeatherTech. ¿Todos los tapetes para todo tipo de clima tienen un reborde levantado alrededor del borde? Sí; el reborde del perímetro del tapete tiene una altura de ½". ¿Qué tan gruesos son los tapetes para todo tipo de clima? El espesor del material es de 3 mm, pero el tapete tiene ½" de altura total. ¿Qué tan profundas son las ranuras? Las ranuras de los tapetes para todo tipo de clima tienen una profundidad de 3/8". ¿Puedo utilizar los tapetes para todo tipo de clima junto con los tapetes FloorLiner?